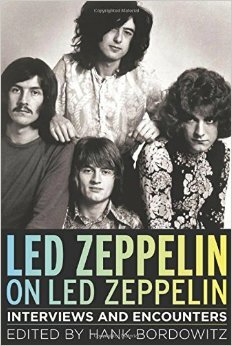 Book Review: "Led Zeppelin on Led Zeppelin: Interviews and Encounters"
A new book chronicles Led Zeppelin’s rise and fall in their own words through rare interviews. Fans of Led Zeppelin, especially those in America, should be excited about this compilation of interviews covering the formation of Zeppelin all the way through their 2012 reception of the Kennedy Center Honor Award. In their glory years, the group was notoriously wary of the press, especially after critics tore them apart following the releases of their early albums. They rarely granted interviews, building the mystery around the band, and let their LPs and concert performances do most the talking for them. Hank Bordowitz, the editor of Led Zeppelin on Led Zeppelin: Interviews and Encounters, really had to dig to unearth the lengthy and often revealing interviews contained here. The result is illuminating and compelling. Reading Led Zeppelin on Led Zeppelin, I often felt like I was watching a good documentary about the band, one that foregoes talking heads and only uses rare news footage to chronicle the life, death and afterlife of one of rock’s most durable and controversial bands. The book is split into three sections. Part I, “Whole Lotta Love” chronicles Zeppelin’s rapid rise to stardom and reveals the interior workings of the band. Part II, “When the Levee Breaks” details the bands gradual fall from grace and the tragedies that lead to their break up in 1979. Part III, “Ramble On,” is a look at the careers of Robert Pant, Jimmy Page and John Paul Jones, the three surviving members of Zeppelin, through the 1980s and up to 2012. Although Plant has had the most successful solo career of the three, the interviews cover plenty of ground for Jones and Page, including Page’s Coverdale/Page album, the Plant/Page albums released in the mid 1990s, a Jones’ soundtrack and solo recordings. What I found most interesting about these interviews was each man’s frankness. While Plant and drummer John Bonham were old friends and quick to express their adoration for each other, the feelings each express for Page and Jones were more respect than any sort of brotherly bond. Plant, for one, was okay with that. In the early years he states being content not socializing with the others outside of the studio or appearing on stage. This feeling may be why he’s avoided any true Zeppelin reunion besides the Ahmet Ertegun Tribute Concert in 2007, which in itself was held to honor the man who signed them to Atlantic Records. The sum of Led Zeppelin was four men who were four equal parts to some incredible music. Each brought something unique to the band’s makeup and replacing one of them would change the sound of the band. In an early 1970s interview, Jones says that if one of the players ever fell out of the equation, Led Zeppelin would not be able to continue. This pretty much explains why they were quick to break up after Bonham’s death in 1979. For, while they were able to soldier on after the tragedies that befell Plant’s personal life, the turmoil caused by Page’s addictions, and the changing musical landscape that treated them like dinosaurs after just 10 years in existence, losing the foundation to their sound, that incredible life force known as Bonzo, was too much to overcome. Any book like this should not only inform about the band, but also inspire the reader to go out and listen to their music, either for the first time or the thousandth. After finishing Led Zeppelin on Led Zeppelin, I not only listened to the classic Zeppelin albums from the 70s, but also revisited Plant’s early solo records and even gave a listen to those Firm songs collecting digital dust on my iPod. Bordowitz did his job by making Led Zeppelin on Led Zeppelin a quick, interesting read, and pulling back the veil on one of rock’s most influential acts. Led Zeppelin on Led Zeppelin: Interviews and Encounters (480 pages, Chicago Review Press) is available on Amazon and at your local bookstore.